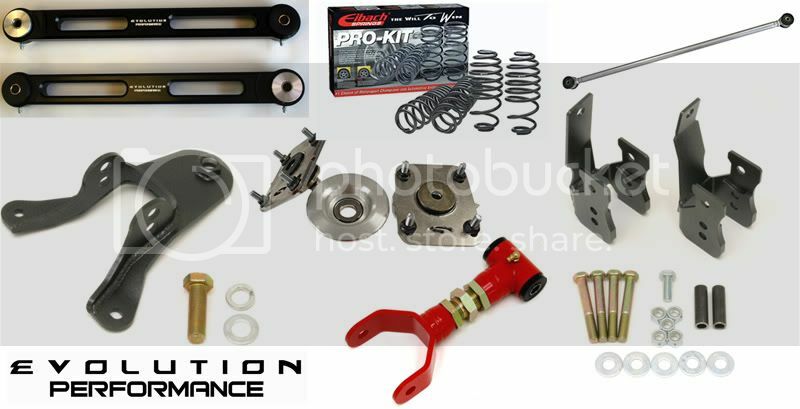 Evolution Performance heavy duty billet Control Arms are CNC machined from 6061-T6 aircraft grade aluminum. Black hard coated for superior appearance and surface protection. Designed for lowest possible weight while retaining exceptional structural strength. 2.5 lbs lighter than OEM arms!!! These control arms come complete with detailed instructions with NO cutting or welding required. Need to reduce wheel hop and improve traction? Our New Adjustable 3rd Link with a poly bushing for the S197 is the ultimate piece for the performance Mustang enthusiast. This competition upper 3rd link, like the original version allows you to adjust your pinion angle. This piece is a double adjustable design allowing you to make adjustments on the car, eliminating the need to remove it from the vehicle for adjustment. Torque deflection associated with the factory piece is eliminated. The single upper control arm is responsible for maintaining pinion angle and preventing axle counter-rotation. This "3 link" style suspension is ideal for autocross and road race applications as it allows the most articulation possible with a solid axle. For drag racing, however, the single, centered link becomes a weak point as the arm is only one inch thick in the middle and made from light gauge, stamped steel. Our upper control arm is made from 3/16" CNC formed plate, TIG welded and gusseted completely around the bushing. The 3rd link is fully adjustable and is powdercoated in Black Hammertone. Our upper control arm mount is a direct replacement for the OE piece and requires no drilling or welding to install. The last generation Fox body Mustangs had upper control arm mounts incorporated into the frame. They also had two upper control arms sharing the load but drag racers were continually ripping the mounts off of the frame when racing. The solution for those cars was to weld reinforcement plates onto the frame. This new Mustang platform only has one upper control arm and the mount is only bolted into place. Our upper mount is made from heavy duty 1/4" plate and can be bolted into place. Complete engineered package, Much more cost effective and higher quality than other brands. A good first step toward improved handling out back is to upgrade the panhard bar supplied by the manufacturer with our chrome-moly unit, featuring urethane bushings for reduced flex. And to make a good thing better, we added our heavy duty Panhard Bar Brace for even greater chassis stiffness. We spent countless hours figuring out where the S197 could benefit most from chassis stiffening. Here is the end result....Made from 4130 Chrome Moly material this brace is specifically designed for the S197. It ties together the inner/outer frame rails and the rear lower control arm mount. Braces are Yellow zinc plated and come with mounting hardware. Can be bolted in with supplied hardware.